Content marketing can be very exhaustive and time-consuming. However, with a good plan, tools and resources, you can make it more effective. Using the right content marketing productivity tools should help you achieve that goal. Here are 12 of the most uncommon content market productivity tools that should help save more time. You can use this content marketing tool to identify how your competitors are ranking on Google. Using SEMrush, it’s easy to assess the amount of traffic going to your competitors’ websites as well as the keywords being used to get higher rankings. What you need to do is enter the web address to your competitor’s website and this tool will reveal the list of keywords used for ranking on Google. Open a free account on SEMrush and register yourself and you can gain access to the top keywords your competitors are using to drive traffic to their websites. You can begin by entering their web addresses (URLs) and watch for both the organic and paid results, traffic numbers, cost per click and more. If you’re aware of these keywords, maybe you can use some of them to bring more traffic to your own site. This content marketing tool allows you to discover the type of content that gets shared the most. Naturally, you want to create content on your website that gets shared across numerous social media platforms. Using Buzzsumo, you can find out the commonly shared content and shape your own content around the same topics. Using this tool, you should enter your own address or your competitor’s website address and find out which content is mostly shared across different social media channels. Also, you can search for keywords and find any content related to these specific keywords that’s shared the most. You can use Buzzsumo to examine the type of content shared on specific social media channels and produce content to similar to what’s targeted on these channels. You can use this to get statistics about what’s working, and use it to get new ideas for your own content marketing strategies. Canva is a power tool used to prepare any promotional visuals to be used on your website. It might be very expensive to hire graphic designers for every image that’s need to go on your website. Well, through Canva, you can perform any graphic design features needed on your site without the need for graphic design skills. You can produce professional and impressive images using a streamlined and simple interface. Even better, you can create similar images to be used on the same content rather than using the same image over and over again. Create a free account, and login via Twitter, Facebook or email. Using the app in your browser is free, and many textual and picture elements can be used for free to start. If you want to upgrade, you’ll get additional images and tools to make it even better. There is a team version, starting at $9.95/month, but the first 30 days is free. This tool allows you to monitor your results without the need for using Google Analytics which can be quite exhausting and time consuming. Create a free starter account, and connect with your Google Analytics profile. Pick the template you need, and save. Quill Engage will send a weekly (or daily) email with a complete interpretation of your website’s results which is simple and easy to understand. 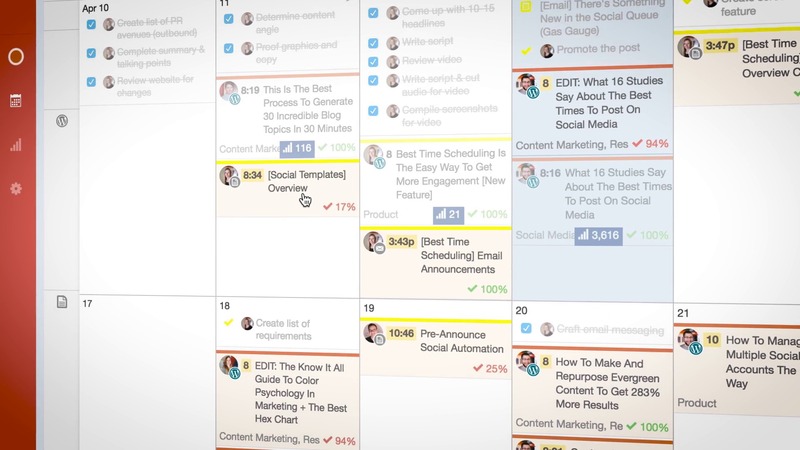 Using Edit Flow, you can build your own editorial calendar which is an essential part of content marketing. If you plan your content accordingly, you can become more productive and produce better content for your visitors. This tool is a free WordPress plug-in that allows you to view all the drafted posts to adjust dates accordingly, send messages to all the team members and also set custom status updates that match your workflow. Create an account, and follow the simple instructions. This is a Google Chrome plug-in that allows you to post content to your personal Google+ profile. Currently, it’s not possible to schedule any posts through Google to your personal profile. However, by using Do Share you can hold any content until the time for posting it arrives. Of course, your browser must be open when posting time comes around in order for the tool to work properly. Also, you can pick content from Google+ and send it to the tool for later posting. This is an automation tool that allows you to link 300+ applications and perform automated tasks. Using Zapier, you can create a triggering task (referred to as Zaps) that automatically initiates different applications. For instance, you can use this tool to create posts of Facebook and put the rest on queue to post on other social media channels. Check out many IFTTT recipes also – another task automation tool. Just like Zapier, Buffer offers an automation feature where you can post to numerous social media channels. Therefore, you don’t have to necessarily log into each one of your social media profiles in order to copy paste your posts. Let this content marketing tool do all the job for you. Yet another Google Chrome Plugin, Momentum allows you to plan your tasks and provides daily reminders. Therefore, if you plan on updating your website’s content on any particular day, you can use this tool to keep everything in check and make sure that everything is completed in time. You can also use this app to monitor the rest of the tools you’re using for your content marketing efforts. Once you confirm your account, you’ll be ready to go. Combine this plugin with calm.com and get more work done with less distractions. Also recommended: A good summary of tools and techniques as a companion guide, was done by HealthAmbition.com You can find this here. Do you always find yourself distracted every time you are on the internet? Do you need an app that blocks your access to other distracting websites when you’re working on your site’s content? Well, thanks to Self Control , you can achieve exactly that. Specifically for Mac users, the app blocks your access to any distracting websites allowing you to allocate more time to your site. Basically, you set a period of time and a number of sites to be blocked then your access to these sites will be blocked during that time. Regardless of whether you delete the app and restart your computer during that time period, nothing changes. If you’re working with a content marketing team, you need a platform where communications are easy and effortless between all the team members. Well, using Slack, you can achieve exactly that. Here, everything is in one place and you can search for it very easily. It’s the best communication tool for most modern content marketing teams. When creating and marketing content for your website, you’re likely to create notes and comments you need to add or follow-up on. Keeping track of these notes can be very difficult. Well, if you’re using an app like Evernote, you can easily get access to these notes whenever you need them. Don’t forget to include the amazing co-schedule product when discussing calendaring and team work for your content marketing and social media projects. It fits right into your WordPress CMS, and has a nifty Chrome browser plugin too. It’s our mainstay product. We also hear great things about hipstersound and defonic, but have not installed/tested them yet.